In 1975, we held our first, and - so far - our only nationwide referendum. It was on whether we should remain in the European Community, as it then was. Until then, the referendum was widely regarded as unconstitutional. Yet, a number of sub-national referendums have been held since 1997 - mainly on devolution - and more are promised - on such issues as entry into the euro. What are the advantages and disadvantages of the referendum? Does it have any role at all in a parliamentary system of government? What are likely to be the constitutional consequences of the increasing resort to the referendum device? 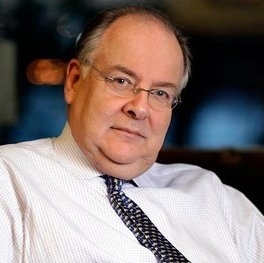 Professor Bogdanor interviewed Lord Falconer. Charles Leslie Falconer, Baron Falconer of Thoroton, PC, QC (born 19 November 1951) is a British Labour politician and barrister.Falconer became the Lord Chancellor and the first Secretary of State for Constitutional Affairs in 2003 under Prime Minister Tony Blair, and would go on to become the first Secretary of State for Justice in a 2007 reorganization and enlargement of the portfolio of the Department for Constitutional Affairs. It’s my great pleasure and a privilege today to welcome Lord Falconer, the Secretary of State for Constitutional Affairs and Lord Chancellor. Those who have been coming to these lectures in the past will remember that the central theme of them has been the Government’s constitutional reform programme since 1997, and those who came to my very first lecture, may remember that I calculated no fewer than 15 major constitutional reforms, including devolution, the Human Rights Act, the directly elected mayor in London, reform of the Lords, and the Freedom of Information Act. Therefore we are particularly grateful to Lord Falconer for coming, and for allowing me, for the second time in this series – the first was with Geoff Hoon, last year, which some of you may remember – for the second time, to pretend that I am Jeremy Paxman or John Humphreys, and adopt an interviewing mode. I should add that Lord Falconer is a very good friend of Gresham College, because he submitted himself some time ago through a previous question and answer session with my predecessor, Professor Richard Susskind, and you can read this interview in a book which Richard has edited, entitled The Susskind Interviews: Legal Experts in Changing Times, which I strongly recommend, and you can get an order form for this book afterwards. It’s well worth reading I think. I think I was “changing times” rather than “legal expert”! Well, before getting into the substance, let me ask you something about yourself. Unlike most ministers, you’ve not been a professional politician, but you were a barrister, and you came directly into the Lords without having been an MP. What made you give up a presumably lucrative career as a barrister for the slings and arrows of politics? I’ve always been a supporter of the Labour Party. I was very keen to get into politics. I had great difficulty persuading any constituency to adopt me! I was very, very keen to take up the opportunity of being the Solicitor General when it was offered, but in order to be the Solicitor General, I had to be in Parliament, which meant being in the House of Lords. Many people who come into the House of Lords, most ministers in the Lords, have been in the Commons before. Now, you haven’t been in the Commons before. Is that an advantage or a disadvantage, to come straight into the Lords? If you look at the ministerial team in the Lords over the last 8 or 9 years, I think you would find probably a majority had not been in the Commons. There are significant numbers of people in the Lords who were in the Commons, but that isn’t the case in relation to the ministers. I don’t know whether it was an advantage or not. People tell me the Lords in its atmosphere is very different from the Commons. I think, whether you’ve been in the Commons or not, you need to spend time absorbing the way it works. It also does politics in a completely different way from the Commons. It’s 30 or 40 years in the Commons since there was a truly hung Parliament. In the Lords now, if two parties come together, they can defeat the third party. That means the Government, to get its business through the House of Lords, has got to make sure the Liberal Democrats and the Conservatives don’t coalesce against it. That’s the consequence of the removal of the hereditary peers. So it’s coalition politics in the Lords in a way that it’s not in the Commons. Yes, before the removal of the hereditaries, two-thirds of the House of Lords were in fact Conservative, or roughly Conservative, peers, because the vast majority of hereditary peers were Conservatives. That’s right. The consequence of that was, there was always a Conservative majority in the House, and the House of Lords therefore developed a practice and a culture of holding back. That culture goes once it’s possible for two parties to come together and defeat the Government, and that will be the position whatever the political colour of the Government may be. This is a fascinating point, and as you’re implying, the House of Lords is now more assertive than it was. This I think does raise an interesting constitutional point, and let’s perhaps go into that, because I lectured on this a little while ago. The House of Lords has traditionally been guided by something called the Salisbury Convention, and I understand that to be that the Opposition should not undermine Government legislation, either by second reading or by wrecking amendments. It’s a convention. It was adopted in 1945, when, for the first time since the Parliament Acts restricting the House of Lords, you had a left wing Government in office in the Commons, and the Conservative majority in the Lords said we must be self-restrained, we must not oppose Government legislation because the electorate have supported it, and therefore we adopt the Salisbury Convention, named after Lord Salisbury, the then leader of the Lords, and we will adopt a policy of self-restraint. Now, some people are now saying, both in the Conservative and Liberal Democrat parties, that convention is no longer relevant because it’s no longer a one-party House. Until 1999, the Conservatives were the permanent majority. There was no way you could really imagine the Conservative majority being undermined, but now, as you say, it’s a hung House all the time, and so some Conservatives and Liberals say, well, the Salisbury Convention should no longer survive, and we should look at Government legislation on its merits, and even if it’s been in the election manifesto, we shouldn’t hesitate to defeat it if we think it’s no good. Now, do you have a view on that particular point of view? Yes, I do. I think it is in principle wrong for the House of Lords to stop legislation which has been in the victorious party’s manifesto, because that is usurping a role that is not properly a role for the second chamber. Constitutionally, the House of Commons is prime. It’s elected, it is the chamber from which the government is selected, the government is selected in the House of Commons on the basis of votes right across the country in a general election. It may well be that there are arguments against particular pieces of legislation, but we live in a democracy. Ultimately, in relation to important matters of political principle, those matters should be decided by the Commons. The House of Lords is absolutely excellent at revising legislation, saying how the principle can better be given effect, saying how legislation can be improved. Let me take three examples where you have issues of principle – the minimum wage, the independence of the Bank of England, devolution to Scotland – all three of which were opposed by the leading opposition party at the time, all three of which could have been delayed for some considerable time in the Lords. Would it have been right as a matter of principle, when those three issues had been put right in the forefront of the electorate’s mind during the course of the general election, that they should be stopped by the House of Lords? In my view, plainly not. Does it make a difference that although one party no longer has a majority in the House of Lords, namely the Conservatives, nevertheless if you coalesce with the Lib Dems or the Conservatives, depending on who you are, you could still stop it? I don’t think the fact that it’s done by coalition rather than one party doing it changes the principle, which is that the second chamber should give way to the first chamber on matters of principle like that. Vernon put it quite mildly. Vernon said there are some people who say that the Salisbury Convention has gone. Two of the people who say that the Salisbury Convention has gone are Lord Strathclyde, leading the Conservatives in the Lords, and Lord McNally, the leader of the Liberal Democrats in the Lords, two people who you might think would be quite significant in the way that it operates. They both say it’s gone because of coalition politics. Neither of them says what replaces it. Neither of them has indicated what are, as they would see it, the restraints on the Lords now. Lord Strathclyde has said expressly he accepts that there is a principle, that the government should have its business in the Lords, but has not sought to define it. There is plainly a principle involved. The Lords should be a revising chamber, which means it can delay things, appropriately, but it shouldn’t be taking on issues of principle. I suppose a Liberal Democrat or Conservative, Lord McNally or Lord Strathclyde, if they were here, might say well, all right, these issues you mentioned, devolution and so on, they were in the manifesto and certainly very noticeable, but frankly most voters don’t look too carefully at the government manifesto, maybe 50 or 60 promises made, and it’s a mistake to think that because we’ve elected a Labour Government, we are going to vote having given approval to every single thing in the manifesto, and they may say that’s a reason for abandoning the Salisbury Convention. They may go on to say, well, if you ask what the limits on the House of Lords are, they’re pretty stringent. They are that they can delay any bill, but only for one session, the Government will still get its legislation through, but sometimes, it has to wait a bit and have second thoughts, and there’s no room for further convention like the Salisbury Convention to limit the power of the Lords any more than it’s limited at present. I think there are two problems with that. First of all, it implies a relation to your first point, namely, the electorate does not concentrate that much on a manifesto, that somebody has got to decide what are the important promises in a manifesto and what are the unimportant promises. The value that informs our constitution, or one of the values that informs it, is democracy, and democracy involves people having the choice about who their government is and what it does. The only guide that you have in relation to the detail of that is the manifesto. To be able to sweep that aside on the basis of for example, nobody really paid very much attention to your minimum wage promise and therefore we don’t need to pay any attention at all to what is said in the manifesto, which is the next stage in that argument, is I think a negation of democracy. My second point was there are already stringent limits on the Lords. They can only delay legislation for one session, so the government will get its own way in the end in any case. The problem with that argument is that it would be open to the Lords to, in effect, defeat every bill that came from the government, which would in effect completely destroy its legislative programme. Indeed, on a number of occasions, when particularly controversial bills have been proposed by the government, as far as the Lords are concerned, and I can think of two – the Constitutional Reform Act, which was changing the role of the Lord Chancellor, and the Hunting Act, some peers made a threat to disrupt the whole of the legislative programme of the government if we didn’t withdraw the particular bills that were causing controversy. The way our system works, if everything was pushed to the point where it was defeated, then we wouldn’t get any legislation at all. Equally, the Lords, if they wanted, could simply by making things last a long time, prevent a piece of legislation getting through. There needs to be conventions, there needs to be restraint. There always has been in the past. I think the difficulty, in the light of the new house with the coalition politics, is what are the limits of those conventions? This discussion raises a very interesting general point, that the more you reform the Lords and the more legitimate you make it, the more assertive it may become, and this seems to me significant in the light of the Government’s view that the removal of hereditary peers was just the first stage in a two stage process of reform. Now, I presume the second stage of reform, whatever it will be, and we don’t yet know (I’ll ask about that in a moment), but the second stage of reform will make the House of Lords perhaps more legitimate still, so it might be even more assertive after a further stage of reform than it is now. Would that be possible? That might well be the position, depending on what the reform is. What we have said in relation to House of Lords’ reform is that there needs to be a debate first of all about what people want the second chamber to be. Do they want it to be equal and substantial, equal and co-substantial with the House of Commons, or do they want primacy of the House of Commons? We believe, as a Party, there should be primacy of the House of Commons, with the House of Lords having the ability to delay and to revise, but we need a debate about that. We proposed in the manifesto that a joint committee of both Houses be set up so the precise conventions could be looked at, and we’re in the process of trying to agree with the other parties the setting up of that joint committee. Once you’ve discussed what the House of Lords should do, then you need to go on and discuss how it should be composed. We’ve indicated there will be a free vote in Parliament on what any change in composition should consist of. There are very differing views on what the composition of the Lords should be. It is a hugely important constitutional issue, and I think it is one where Members of Parliament, and the Commons are the critical body in relation to this, should have a free vote, so that we move forward to another stage only when there is a widespread consensus. But will the Government itself present a view on whether we should have an elected or part-elected chamber or not? Will there be a Government view? There will not be a Government view. It is going to be a free vote in relation to that. Will there be a Government view on whether the powers of the House of Lords should remain as they are or perhaps be further restricted? The Labour Party indicated in its manifesto, which the Government has accepted obviously, was elected on this basis, that we don’t want to fundamentally change the way the Parliament Acts operate. We think consideration should be given to whether the Parliament Acts can apply to secondary legislation, and we think that a limit should be put on the period of time that bills stay in the second chamber, not with a view to limiting debate in the second chamber, but trying to avoid a circumstance where if there were a great confrontation between the first and the second chamber, that confrontation would only be about the individual bill that caused the disagreement, and wouldn’t lead to a situation, as I indicated before, when the whole of the Government’s legislative programme was threatened. If there are to be disputes, they should be about a particular issue. By secondary legislation, you mean delegated legislation, statutory orders and the like, the sort of implementing matters needed to make primary legislation work, and of course on those matters the Parliament Act doesn’t apply. It has an absolute veto, so it could in theory hold government up forever if it wished. And that is what you want to restrict. But isn’t there a danger that if you do restrict, even slightly, the powers of the House of Lords, it may be more difficult to get good people to serve in it, particularly people to stand for election to the Lords if the outcome of all this is that you’re going to have a part-elected House of Lords? Why would people stand for election to a chamber which really has very little formal power? I think in terms of changing legislation, the House of Lords has been hugely significant in the last 7 or 8 years, and whatever arrangements you make in relation to composition, it seems to me extraordinarily unlikely that we’re ever going to move away from there being coalition politics in the Lords, and it’s the fact that there are coalition politics in the Lords that makes the Lords so significant in relation to changing the detail of legislation. On the secondary legislative powers, as a matter of practice, the House has very rarely defeated secondary legislation. Indeed, there is a debate about whether or not there is already a convention that they should not veto secondary legislation, because, in practice, secondary legislation can be just as important as primary legislation. Can I give an example? In the Equality Bill that is going through Parliament at the moment, there is power to produce secondary legislation to introduce a code that prevents discrimination against people on the grounds of their sexual orientation. Should we be giving the second chamber an absolute veto in relation to the terms of such legislation? I don’t think that we should. To give the Parliament Act scope to cover secondary legislation is doing no more than I think what most people would think is the current position anyway. One of the more general problems of democracy, which I’d like to talk about a bit more later on, is the falling rate of participation in so many elections, not only election to the House of Commons, but perhaps even more remarkably, the elections of devolved bodies and London government. I was one of those strongly in favour of a directly elected mayor in London, because I thought it would increase interest in politics and turnout, but I think turnout was only 34%, very low indeed, and perhaps it’s a law of political science that the more elections you have, the lower the turnout, I don’t know. If you had an elected second chamber, part-elected or wholly elected, is there any reason to believe that turnout would be any higher than that, that a lot of people would suddenly find enthusiasm for such a secondary elected chamber when they don’t turn out for the London Mayor or Welsh Assembly or local government or anything else very much? I don’t know what the turnout would be for any elections in relation to the second chamber. I think the point that you make about reductions in people’s participation is very worrying. The most obvious example of that is that the numbers of people participating in general elections between – well, compare 1945 and 2005, there has been a very significant reduction in the number of people who participate. There was a slight shift up between’05 and’01, but it was from something like 59% to 61%. In 1945, well over 70% voted. In 1950, the election after it, it went up to over 80% voting. Now, anybody engaged in democracy would be very, very concerned about it. I personally think, by a million miles, the most important thing that determines how many people vote in a general election is what each of the political parties stand for, and that is far more important than how you can vote, whether there’s postal voting, whether there’s e-voting, whether you vote on a Wednesday or a Thursday or a Friday. So the sorts of measures that one talks about to make it easier to vote have some part to play, but ultimately, the most important thing of all is what the politicians stand for, what their parties stand for, and what the public think on them, and I think by a million miles, the people who are most responsible for ensuring high participation are those engaged in politics. Well perhaps particularly worrying about the fall in turnout is the fall in the turnout amongst younger voters. In the election of 2001, I think amongst 18-24 year olds, just 39%, and amongst young women between 18 and 24, just 33%, one third of eligible voters. Are there particular measures the Government could consider to deal with that, this very worrying lack of turnout amongst young voters? I think the lack of turnout amongst young voters is very significant. There are also much greater drops in participation in voting amongst certain black and minority ethnic groups. There are also less people voting from poorer backgrounds. There are less people voting from people who’ve done less well in education than others. We are developing a democratic divide. The better-off, better educated you are, the more likely you are to vote. That was not the position in the not too distant past, and it’s a very, very dangerous development I think. Vernon’s question was about young people. We need to make young people understand the importance of democracy. That means much more citizenship classes in schools focusing on education about the importance of democracy. People who currently don’t feel they’ve got a stake in society, for economic, racial or other reasons, have got to understand that there is a stake which would be benefited by participating in the democratic process. I think everything, however, always comes back to what do the politicians stand for. Can I go back now to your own position? When I introduced you, I introduced you as Secretary of State for Constitutional Affairs and Lord Chancellor, and that first title is a new title, but also your role as Lord Chancellor has altered, and that change was formalised with the Constitutional Reform Act of 2005, which you’ve mentioned. Could you explain roughly what the changes are, and why they were thought necessary to be introduced? Before 2003 when you were appointed, we managed without a Secretary of State for Constitutional Affairs. Why has this changed, and why has the role of the Lord Chancellor changed? The role of the Lord Chancellor before the changes was three-fold. He was the Speaker of the House of Lords, he was the head of the Judiciary and a judge, and he was a minister of the Crown responsible for courts and legal aid and a number of other things, but courts and legal aid were the things that most of his money were spent on. He was different from all other Cabinet ministers in that, being a judge, he had an independence and an objectivity from the Government, and he spoke on behalf of the judges in Government. The effect of the changes is he’s no longer a judge, he’s no longer the head of the Judiciary; formally from the 3 rd of April 2006 that will be the job of the Lord Chief Justice. He continues to be the Speaker of the House of Lords, but the House of Lords voted towards the end of last year to elect their own Speaker. They will have further votes upon how it is done, but I anticipate during the course of this year, they will elect somebody else to be the Speaker of the House of Lords. Once that change is effected, you will end up with the Lord Chancellor being a minister in the traditional way, with one especial added responsibility, and that is to protect the independence of the Judiciary. Those changes reflect the inevitable movement away from the idea that you could have a judge who was also a Cabinet minister, who was also appointing all of the other judges. You need to objectify and make separate from the Executive the appointment of judges, and that’s why a Judicial Appointments Commission has been set up. You also need, within Government, somebody who when thinking about how you spend legal aid, when thinking about how court administration operates, should be thinking not just from the point of view of the judges, who have got terrific views, but they represent one particular ambit, but like all other ministers, thinking more in terms of how do you move this forward in political terms. So it’s a fundamental change, it’s a very important change. It was a change that in practice was already happening. For example, my predecessors had increasingly rarely sat as judges because it was increasingly difficult to find cases where there was absolutely no Government involvement at all in the House of Lords. The process of appointing judges had become increasingly objective in the sense that there were panels that had been set up. The role of the Lord Chancellor as Speaker of the House of Lords had become increasingly formal and increasingly less engaged in the affairs of the House of Lords. But the Constitutional Reform Act accelerated the end of the old arrangements, and set in place objective procedures for the new arrangements. Well, some Lord Chancellors in the past were strikingly political. I remember hearing Lord Hailsham when he was Lord Chancellor speaking at Oxford, and he remained President of the City of Oxford Conservative Association, and his speech was about the importance of preserving judicial independence, and he said the best way of doing that was to vote Conservative in the next Election, so there was a bit of an intermingling between the judges and politics! Well I mean, there’s a very good example of why you did need to change the role of the Lord Chancellor I think! As you say, the method of appointment of judges has changed. Is your role in the appointment of judges now purely formal, or do you imagine that you might actually use your discretion to reject particular suggestions made by the new Commission on Judicial Appointments, which will have that main role? Is your role formal? My role is not formal. The new arrangements mean you could only be appointed a judge if you are recommended by the Judicial Appointments Commission. It is extremely important that the Executive is accountable for the overall process and that they feel responsible for the appointment of judges, because you do not want a complete separation. So the Lord Chancellor has been left with the power to reject once or ask the Judicial Appointments Commission to think again about an appointment, but if the Judicial Appointments Commission insists on the particular appointment, then the Lord Chancellor is compelled to accept it. Do you envisage ever using that power really to reject a recommendation? I think it would be extraordinarily unusual for the Lord Chancellor to use the power, because I do not envisage the Judicial Appointments Commission making proposals for inappropriate people to be judges, but it’s there, and it means that there’s a responsibility in the Lord Chancellor to see that the process is one that is acceptable. But the power’s a long stop in effect. Can we now go back to the Constitution Reform Programme and look at it in the round? Now, many people say, and they’re not necessarily critics of the Government, but they say that the Government’s Constitutional Reform Programme may be all very well as far as it goes, but it’s a bit ad hoc and piecemeal. They say we can’t see any overall plan or overarching aim in what’s being done, no general theme, a bit here, a bit there, devolution here, Freedom of Information here, Human Rights Act, London Government, and so on, but no real plan or obvious destination. Is that a fair criticism of the Government, and if so, does it matter? No, I don’t think it’s a fair criticism of the Government. I don’t think you could ever say that a constitution is perfect because circumstances change. I see the role of constitutional reform as being to give effect to the values of the country in which we live. The values of our country are democracy, tolerance and the rule of law. Does our constitution reflect those values? I think it does, but I don’t think it reflected them adequately in a number of respects, and I think you’ve always got to be looking to see whether they needed to be changed. Let me give examples in the context of the changes that we’ve made. Tolerance and the rule of law, incorporating the Human Rights Act, provide people with more readily accessible protections in respect of their rights. It ensures that there’s legal protection reflecting our views of a tolerant society. It also, I think, indicates people’s desire to allow the judges more room to express views about legislation than they’ve had before, but without giving the judges the decisive power on big policy issues. That seems to me to be an example of where constitutional reform better reflects the values of our society. Now, you’re never going to say the constitution is now perfect, it will never need changed, because, as I say, circumstances change, but what is our guiding principle is to give effect to those three values. Devolution is to make democracy better connected with the people of Scotland, Wales and Northern Ireland. Those are examples of constitutional change giving better effect to those three basic values in our society, and that is the principle. Well, I’ve said often during my previous lectures that constitutional reform, rather sadly for the sale of my books, is not a popular subject. You don’t find the public clamouring for the Freedom of Information Act, Human Rights Act, and all the rest of it. It’s not a matter of great interest, and I think if you ask the public what their priorities are, they’re I suppose broadly to do with the public services, education, health and the like. Why is it that one of the central themes of the Labour Government, particularly in the early part, from 1997 to 2001, one of the central themes has been constitutional reform? When the history of the period is written about, I think this will be brought out, but in a way, it’s very odd for a Government to do that, because, as I say, people are clamouring no doubt for improvements in the hospitals, improvements in the schools, and so on, but they’re not clamouring for constitutional reform. I think you are right. People are not clamouring for constitutional reform, and very few elections have ever been determined by differing views in relation to constitutional reform, but we became the Government in 1997 after a long period of Conservative Government, and I say Conservative both with a big “C” and a small “c”, and that Conservative Government had not favoured any constitutional reform. I think constitutions need to be regularly maintained to keep them up-to-date with people’s view about their values. There having been very little constitutional change before 1997, the time was right. People were keen, for example, for there to be the Human Rights Act, for there to be the Freedom of Information Act, for there to be the removal of the hereditaries. It’s because there had been so little in the years that had gone before that it was time for a big change. As you said a few moments ago, one of the consequences of this programme has been to give more influence to the judges, and the judges have seemed to contradict the Government’s view on a number of questions dealing with the rights of often very unpopular minorities – asylum seekers, anti-terrorist legislation, and so on. I suppose if you asked the judges they would say that we’re the people who ought to decide the balance between the security of the public and the rights of individuals, but I suppose if you asked the Government and elected MPs, they would say we’re the ones who should decide. Is this going to lead to a clash between Government and the Judiciary, and who is right in that dispute? I don’t think it will lead to a clash. It has not led to a clash at all before. The fact that the judges take a view about legislation, as they did in relation to the Belmarsh proceedings, was exactly what was envisaged by the Human Rights Act. The effect of that was they declared it to be incompatible. It was for Parliament to decide what to do. This Government accepted the view of the judges, as they inevitably would, and gave effect to different legislation. So far from there being a clash, each part of the constitution was operating in the way that it was expected to operate. Who should determine the balance between security and freedom? Well, there are two bodies that have got to decide that. The first in Parliament in primary legislation, and I think we as a country want Parliament to decide that. So if, for example, there is a terrorist outrage, as there tragically has been in this city last year, then people would expect Parliament to express a view if the law needs to be changed. But it is then for the judges, in accordance with the law, to ensure that law, passed by Parliament, is given proper effect, freely and fairly, with everybody being equal before the law. I think ultimately we as a country have always taken the view that the big political issues should be decided by Parliament, and that the judges should be the bastions of our freedom but in the context of Parliamentary sovereignty. We don’t want the judges, as they do in the United States of America, for example, to decide should there be the death penalty. We don’t want the judges to decide should we ban abortion because it’s wrong in principle. We don’t want the judges to decide how fast should we go in relation to desegregating a segregated society. All of those decisions were taken by the judges in the United States of America, because they’ve got a written constitution which ultimately can in certain circumstances override whatever view the legislators take. We don’t have such a constitution, but as a matter of principle, I don’t think we want that approach. But can you not envisage a situation where the Government is determined on some measure of anti-terrorist legislation, supported by MPs, supported by the public, which the judges say is contrary to the European Convention? They issue a declaration of incompatibility, but MPs and the Government say, no, no, we’ve got to do this, terrorism is such a danger we cannot in this case amend or reverse the statute, and then there is a clash between the Government and the Judiciary. Can you not envisage that happening? I cannot envisage that happening. The reason I cannot envisage that happening is because – and this is speaking from the point of view of this Government – we specifically introduced the European Convention on Human Rights on the basis that we would comply with it. The fact that, like any government from time to time, we are told this measure or that step goes beyond it does not mean that we do not accept fully its provisions, and we will obey any order made in relation to it. Indeed, one of the great strengths of our society has been everybody understands that from time to time the courts, whether it be under the Convention or otherwise, say that the government has broken the law. That is never regarded as a great constitutional disaster because everybody knows the government will then comply with the law. It’s an incredibly good way of striking a balance. I do not envisage there being any great clash where the Government will wish to override the Convention, far from it, and equally, I do not think the mood of the country, and therefore the mood of the politicians, would be to seek to try to get to that situation. So you think it is in fact a constitutional convention that whenever the judges say something is against the European Convention, the Government will automatically amend that legislation accordingly? What has happened so far is that that has always happened. I think as the Government who actually introduced the Convention, I can envisage no circumstances in which it wouldn’t want to comply with such a decision. I certainly couldn’t say it was a constitutional convention yet. It hasn’t remotely got that far, and indeed, the Human Rights Act is so drafted that it gives the judges power to make the declaration of incompatibility with primary legislation, but it leaves it to Parliament to make the decision about what to do. Again, that’s a very skilful way of striking the balance. It was Lord Irvine’s idea, and it’s a very good way of doing it. I was fortunate enough to be at a conference at Ditchley a couple of months ago at which the former Lord Chief Justice Harry Woolf was present, and I asked him what happens if there is a clash between Parliamentary sovereignty, the government with a view, and the rule of law. He said, “That’s a question that had better not be asked.” Is that right? We have over the last 300 or 400 or 500 years managed to avoid a clash. The constitutional position is that Parliament is sovereign. That reflects our value of democracy, so ultimately, Parliament can pass any law that it wants. That’s been the position for a long, long time and Parliament has always avoided, in recent times, by which I mean the last 200 or 300 years, there ever being that clash. So I think we should take the view that our system works. Let’s get on now to electoral reform, reform of the electoral system to the House of Commons. Tony Blair has promised a referendum on electoral reform, and he’s promised a Government review on the electoral system. I think that is taking place at the moment. Are we going to have a referendum on the voting system? On voting systems, what I think the commitment was in a previous manifesto was that should we wish to change the electoral system, then there would be a referendum. At the moment, I detect no groundswell whatsoever for change in the electoral system. There are proponents of different systems. Over the years, our system appears to have produced strong government, and it has also produced government which reflects the views I think of the public at large. That’s a subjective view, but if you think about, for example, the elections during the late Seventies when Margaret Thatcher was first elected, and the Eighties, the public during that period did want a Conservative Government, and they didn’t want a Labour Government. I think in 1997, the people did want a change in government, and they were very keen for there to be a strongly endorsed Labour Government, and that’s what happened in 1997. 2001 was a repeat of 1997. 2005 was a Labour Government elected but with a reduced, a quite significantly reduced, majority. Now, form your own view as to whether or not that reflected what the people wanted. I suspect that it did. I suspect it is much better to have a system which allows for significant change to occur, for example’79 or 1997, rather than a system which involves very often the same people being in government for long periods of time, and general elections simply having the effect of changing who the minor coalition partner is. Democracy requires that there is a real chance for renewal, that you can have a change when that’s what the people want, and our system produces that. So I detect no groundswell, I don’t think people are particularly keen to indulge in that particular part of constitutional reform. If there was to be a change, of course there’d be a referendum, but I don’t see that being at the top, or even in the middle, of any sort of constitutional agenda at the moment. Well, you speak of government reflecting public opinion. It’s fair to say the present Government was returned with a comfortable majority, by 36% of the vote, which means 64% of the voters voted against it. Now, is that a reflection of public opinion? Well, can I answer with another question? Do you think what the people were saying was can we have the Conservatives in power in coalition with the Liberal Democrats? I don’t think they were. In 1945, Clement Attlee did not have a majority of the votes in 1945, and he got an overwhelming majority for change in relation to the proposals that he was making. Now, did the people want that at the time? Form a view…and I bet you they did. We have been excellent in terms of making change peacefully and effectively in relation to the people who run our country with this first past the post system. So I don’t think we should change it. Well, I don’t think it is a lottery. Look at the results. Do you think it was a lottery that Clement Attlee became Prime Minister in 1945? I most certainly don’t think it was. I think it expressed the view of the people. Shortly before 1997, Tony Blair did seem more sympathetic to electoral reform as a means to a realignment with the Liberals to create a progressive alliance in politics. Now, Labour seem to have lost a bit of support, and many people are predicting the next Parliament might be a hung Parliament. Do you think the Labour Party might revert to that view and come to be more sympathetic to electoral reform than it was at the time when it won these landslides? Well, I can only express my own view in relation to it, and I can only express the view that, as I say, it’s not on the agenda at the moment. I think a lot of the discussion pre-’97 was in the context that there were some people who believed that without change the left of centre parties would never regain power in this country, but I think the change that was required was for the left of centre parties to move closer to the centre, and that’s what happened with my Party and that’s what then transformed the political landscape. So you are personally against change and would vote no in a referendum? I see no basis for change at the moment. I am against change at the moment. Therefore, if that remains the Government’s view, there won’t be a referendum, so sadly, I won’t get an opportunity to vote on it. Now, can I get on to the final issue of constitutional reform, which is devolution? I think many people will remember – we’ve discussed this – that devolution in the North East was rejected in 2004, so probably for the moment, English regions, are dead. But the Opposition say there’s a lot of disquiet in England over imbalance, that Scottish MPs can vote for English matters, say the forthcoming Education Bill, but we can’t vote on Scottish educational matters. I think Lord Baker of Dorking, formerly Kenneth Baker, a well known Conservative Cabinet minister, is introducing a Private Member’s Bill into the Lords saying there should be an English Parliament. What do you think of that? I think that’s an extremely bad idea. I think it is an anomaly, the West Lothian Question as you put it to me, but we have to have a national Parliament. That means if you elect people to a national Parliament, they’ve all got to have equal rights in relation to that Parliament. The consequence of that is that from time to time Scottish Members of Parliament will vote on things that don’t directly affect Scotland. Indeed, from time to time, there are a significant number of issues. For example, Northern Irish bills, where all vote on Northern Irish bills even though they affect Northern Ireland. I think it is critical for the preservation of the Union that we have a national Parliament. I think it is absolutely critical that all of the people who participate in the work of that Parliament have the same rights as each other. I think issues like education in schools in England, which will have a huge impact on expenditure in Scotland, because of the Barnet formula, or issues like what happens to Northern Ireland, which are hugely important constitutionally, should be decided by the whole of our nation, not just a bit of it. Is there any intention now that English regional devolution seems to be dead, to do anything more for England in terms of decentralisation, local government reform, directly elected mayors, or anything of that kind, or has reform in England come to an end in theory? I don’t put forward any specific proposal, but I think making sure that local government is strengthened, making sure that there is a profound and real role for local government in providing proper leadership at the appropriate level, not by new elected institutions, but ensuring that there is a proper economic, proper political leadership in local government and in the regions, remains an important priority. You are right to say that the defeat of the referendum on the North East Regional Assembly means that elected assemblies for the regions may well be a considerable time in the future, but that does not mean that we thereby neglect the institutions of the regions or in local government. Let me ask a final question to wrap things up. I said earlier on that constitutional reform was a central theme, certainly for the first part of the Labour Government, from 1997 to 2001, and we’ve seen a good deal since then. Do you think over the next few years, if the Labour Party is returned, will we see a great deal of further constitutional reform, or will it be solidifying what is already there, or should we expect further radical changes? Have the major things already occurred or are there going to be more radical changes ahead? Well, there is still Lords’ reform, which needs to be looked at. I do not think that constitutional reform will occur at the rate or in the quantity that it did post-’97. The rate and the quantity of constitutional reform then was, as I’ve said, the product of a long period of constitutional stagnation, when no reform had taken place. There are considerable numbers of reforms that still need to be worked out – not only worked out, but actually delivered. So the Constitutional Reform Act has passed. A Supreme Court needs to be built, or a building renovated and put into place. The Freedom of Information Act needs to be bedded down and spread across more public authorities than it applies to at the moment. So there are things to do, but the rate and pace of change in relation to constitutional reform was inevitably much greater in the immediate post-’97 period than it will be now. Well, on that note, let’s draw these proceedings to a close, and let me thank you. I’m sure I echo everyone’s view here. You’re one of the busiest Ministers in the Government. I know you’ve got another engagement straight after this one, and it’s most generous of you to give up your time, and I’m sure appreciated just as much by everyone here as it is by me. Thank you very much indeed.